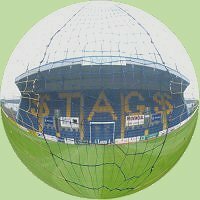 Mansfield Town, along with Wrexham, were relegated from the Football League to the Conference at the end of the 2007/08 season. Their places were taken by Aldershot Town and Exeter City - 2007/08 Conference table and play-off results. Finishing as champions of the Conference in 2012/13 Mansfield were promoted back into the Football League - 2012/13 Conference table. * Mansfield had two points deducted in the 1981/82 season after fielding an unregistered player - full details. When first opened this stadium was likened to a bed pan. Although not an English ground, Manchester United were the visitors for the first football match played there - in August 2010. In 2011 the ground hosted the Europa League final. Name the Stadium.